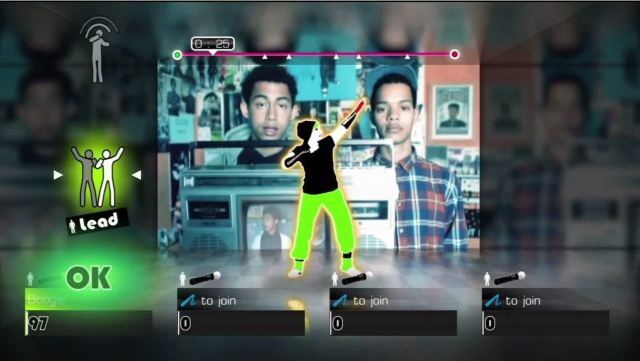 Dance games eh, can anyone remember a time when they weren’t around? Ok so anyone who can remember a time before the Wii probably can, but now they’re a regular feature across all three main consoles and it’s getting increasingly difficult to ignore them. But with so many now on the market it takes something special to stand out from the crowd and get noticed, and with Get Up and Dance O Games have tried to inject something new into a busy market. It’s a shame it isn’t really enough to wow you. Leaning firmly towards entertaining a few friends at once Get Up and Dance allows you to boogie along to any of the 30 songs provided either alone or with a few mates. While the options are there to dance alone, it’s the group dance modes that shine the brightest, giving you options to either do one off dances or starting a short career in front of a set of talent judges. It’s easy enough to settle on a lead dancer and assign others as backing dancers, giving a slightly more authentic feel to other “everyone do the same” type games. The odd thing is the choice of songs on offer, where the mixed bag is hoping to please everyone. In reality, in the same way a radio station that’s a mix of Radio 2, XFM and Kerrang would only please the most eclectic of music fans, the selection of songs in Get Up and Dance won’t please everyone all of the time, and you’ll probably only find a couple that you actually genuinely like. It’s not every day you find Pulp, Dusty Springfield and Jessie J on the same menu. As a result it’s probable there’ll be a small argument about song choice, resulting in your little sister sulking when you refuse to dance to Taio Cruz. Other game modes include an interesting fitness option, which gives you a month-long set of dance exercises with the intention of knocking a few pounds off, but each dance is so lightweight it won’t really do much to anyone except the most doughnut-quaffing fatster, so it’s really an option for someone looking for a longer term game mode to keep them interested. Sadly, with the other game modes being fairly standard fare you’re unlikely to find any real longevity anywhere other than this, and you get the feeling this will find a spot near the back of the game shelf next to the other “party” games that only come out at Christmas, birthdays or any other time where Nan has had an extra sherry and wants to shake her stuff. Technically it’s sound enough; the Move integration is tight and responsive, and goes some way to show me just how bad I am at dancing. The idea of playing the music video in the background to make you feel like you’re really dancing in a show doesn’t really work when you end up looking like Mr Bean at a disco, although the younger gamers might find this a nice touch. It also doesn’t help that the little icons telling you what to do come a little later than would be helpful, and falling over is more of a certainty than a worry. It goes well with the Mr Bean look. So, it’s another dancing game. Another dancing game that does its best to be something new, but all things considered just… isn’t. It works, and isn’t a bad game as such, but when there’s so much else on the market that does the same thing it’s just very hard to give a firm recommendation. If you can pick it up cheap, have a few friends to play with (who each need their own Move controller) and enjoy dancing to every style of music this side of opera, then you might just click with it and have a ball. Otherwise it’s difficult to see where Get Up and Dance fits into a market busier than your average Pussycat Dolls gig.